Art Elements Theme Challenge – Horses. It’s Challenge time again over at Art Elements and this month Jenny hosted the challenge and picked Horses as here theme. 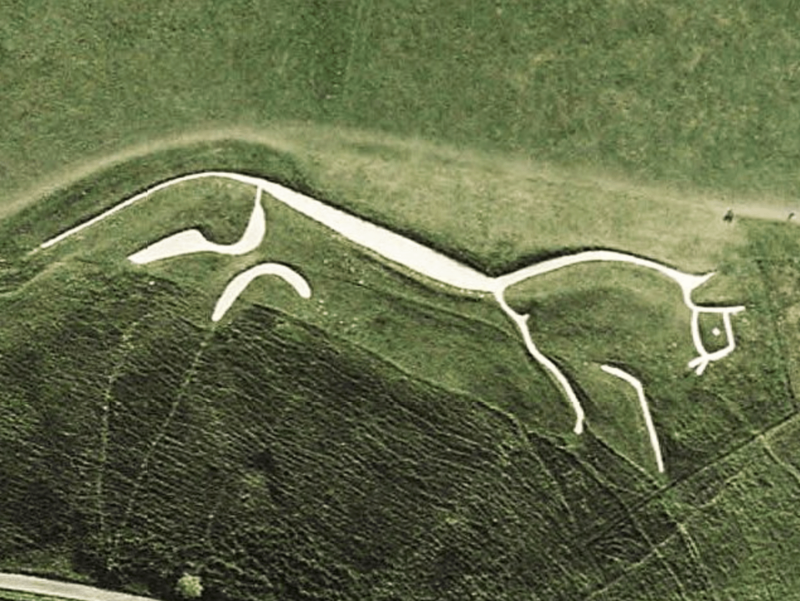 As soon as this theme came up I knew exactly what my them was going to be – The White Horse of Uffington. This prehistoric chalk hill figure featured in my childhood as I had an Aunt and Uncle who lived in Uffington in Oxfordshire where the horse is located. We often went to visit which was no hardship as we were spoilt rotten – My aunt made the best cream cakes! So it seemed a no brainer to use this as the inspiration for my challenge piece. 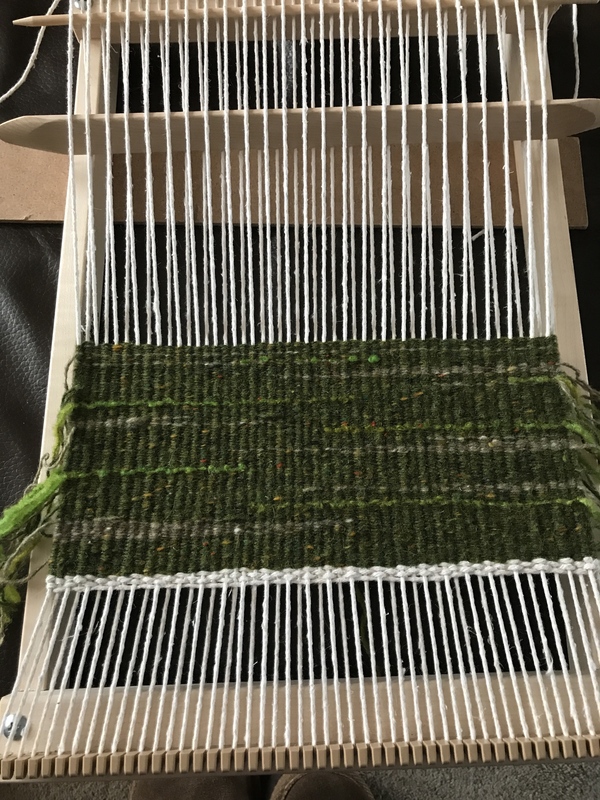 I had in mind some sort of textile piece and as I took delivery of a new weaving loom earlier this month I decided that’s the way I would go. I used a heavy white cotton thread for the warp as I thought this would pick up the chalky whiteness of the horse well. I then began to weave a variegated green background to represent the grassy hill. I considered weaving the horse into the design using the design using the cartoon method but because the horse is so linear I was a bit concerned that I would be able to get smooth lines. Instead I decided I would embroider the horse onto the completed woven piece and here’s the finished weaving after I’d take it off the loom. I embroidered the horse motif onto the background with an off white cotton thread and trimmed the bottom fringing. At the top the warp threads were woven into the back and knotted to create hanging loops. I still need to stain the dowel a distressed white and add a hanger but other than that it’s pretty much finished. 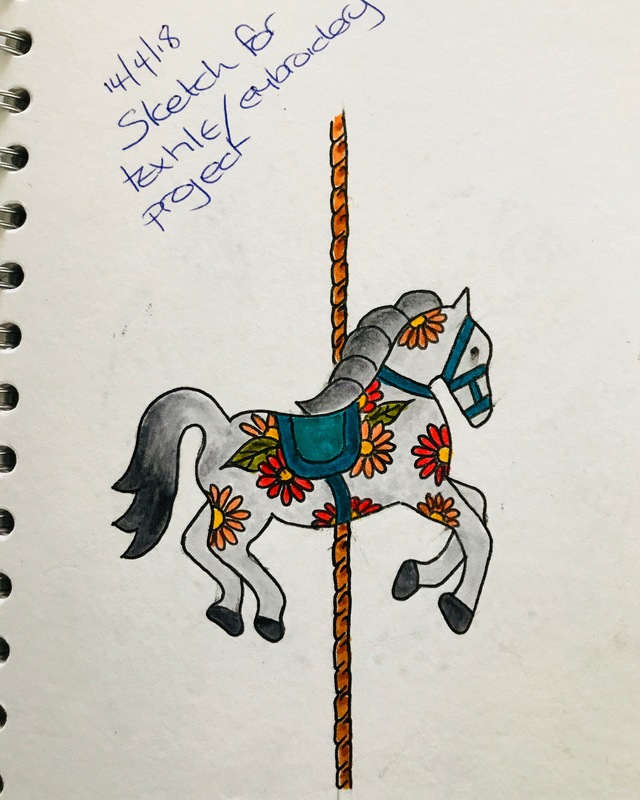 I was hoping to do a second piece for this challenge – an embroidered applique piece inspired by carousel horses but unfortunately I ran out of time and never got further than the initial sketch. So that’s another one for the TBD (to be done) pile. I’d like to thank Jenny for coming up with this great theme and I hope you’ll join me for the blog hop to see what everyone else has been inspired to create…just click on the links below. I love, love, love the woven piece! The embroidered horse has turned out really neat too – love it! I love your woven piece and the story behind it. Just wow!! that is a beautiful piece of art. This piece is great! It’s so true to the inspiration – great memories! I LOVE IT Leslie! I love the greens that you used, they are beautiful and remind me of a lush moss and then there is your stunning horse, just perfect! This piece makes me want to try weaving!!!! The white horse is gorgeous. The colors are perfect and the textures make me think of hills and fields. Your carousel horse sketch is so sweet, I hope you find time to embroidery it. The weaving and stitching are fantastic, and what a lovely memory associated with it. The sketch is gorgeous on its own, even without the embroidered appliqué piece. Your weaving skills are impressive! I need to keep practicing. 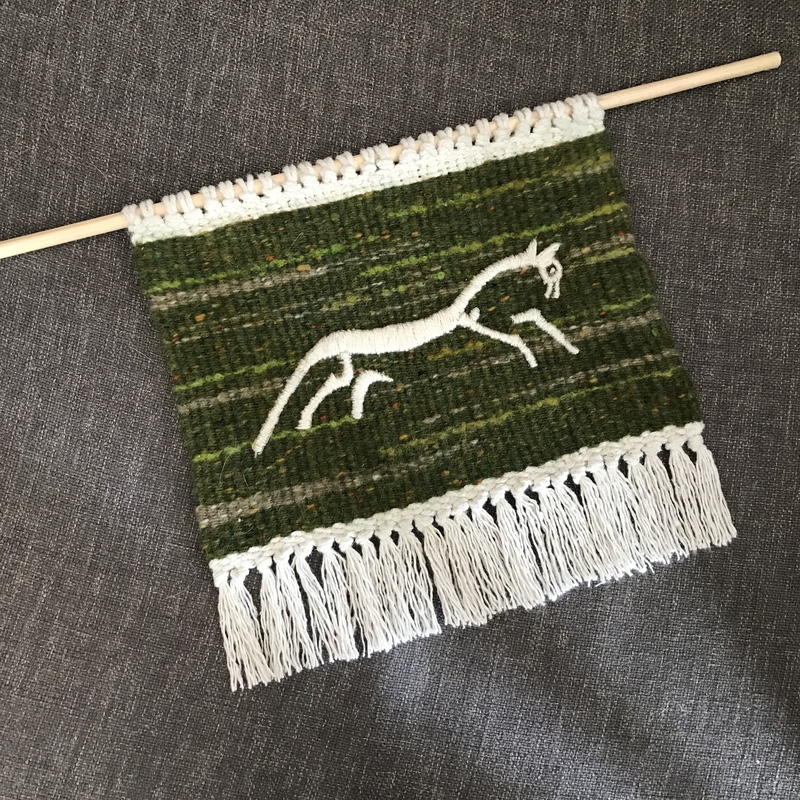 I just love the colors of the weaving and your idea to embroider the horse was brilliant. It’s a lovely piece. I can just imagine what you will do with the carousel horse embroidery when you get a chance to work on that. Your woven artistry shows us experience, patience & oh so much talent. Love the carousel horse’s colors & forms, can’t wait to see a finished piece. 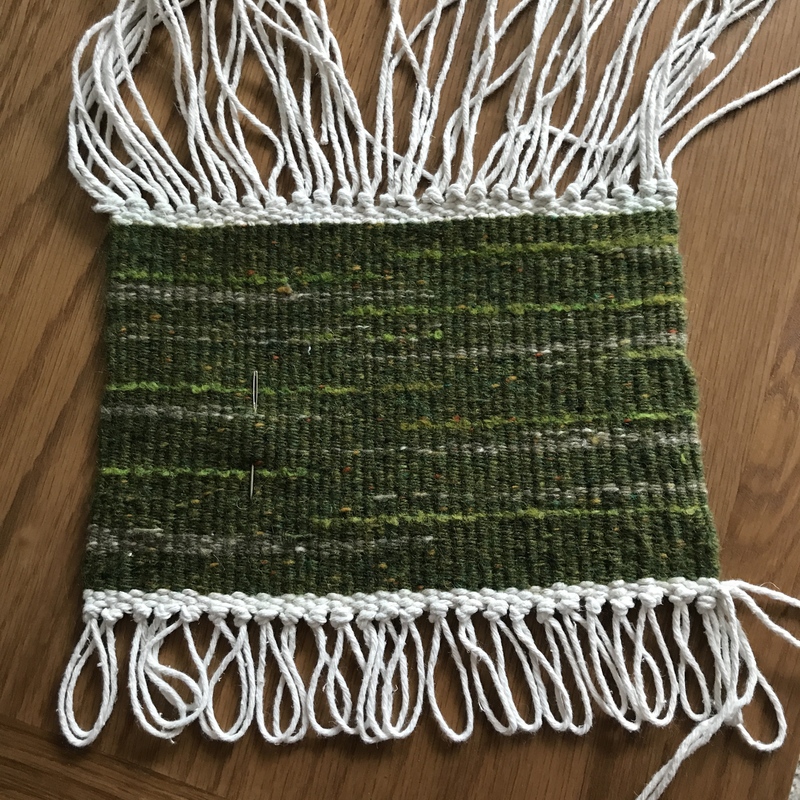 Really cool inspiration and weaving Lesley! Love, love, love it! IT is simple but so artful. Awesome. Thanks for sharin git. Gorgeous piece – I love the colors you used to weave the piece and I love the embroidered horse and how it pops against the green. The sketched horse is awesome – would love to see the finished piece! Yes ! You know I love this 100%. Beautiful greens and fine detailed stitches. And carousel horses- what a great idea! I hope you do work on that later.